Available from Aqualab Scientific , Hach LDO sensors are approved by the EPA for use in water quality monitoring applications. 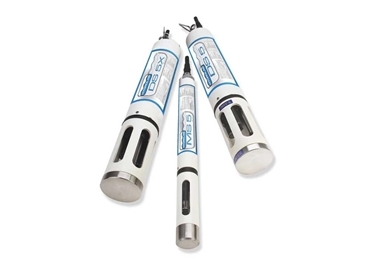 Designed to measure dissolved oxygen quantity in water, Hach LDO sensors are integrated into Hydrolab Series 5 water quality monitoring instruments consisting of the Hydrolab DS5X (DataSonde 5X), DS5 (DataSonde 5), and MS5 (MiniSonde 5). Luminescent dissolved oxygen sensors or LDO sensors use a sensor cap coated with a luminescent material. When blue light from an LED strikes the luminescent chemical on the sensor, the luminescent chemical instantly becomes excited and subsequently relaxes to release a red light. The higher the oxygen concentration, the lesser the red light given off by the sensor cap. The red light is detected by a photo diode and the time it takes for the chemical to return to a relaxed state is measured. The oxygen concentration is inversely proportional to the time it takes for the luminescent material on the sensor cap to return to a relaxed state. Hach LDO is one of the most reliable and accurate dissolved oxygen sensors on the market today. Hach LDO sensors, unlike polarographic dissolved oxygen sensor technologies do not consume oxygen, eliminating the need for a circulator to maintain flow around the sensor. The sensors do not require frequent calibration or cleaning, resulting in longer sensor life and more stable and accurate readings.